4 shows in Tôkyô (Kabukiza, National Theatre, Cerulean Tower Nô Theater), 3 in Ôsaka (Shôchikuza, Kintetsu Art Kan), 1 in Matsumoto (Matsumoto Performing Arts Centre) and 2 tours (Eastern Provinces, Central Provinces)! Ichikawa Ebizô, Ichikawa Ennosuke, Ichikawa Sadanji and Ichikawa Chûsha perform at the Kabukiza! Living National Treasure Sakata Tôjûrô, Living National Treasure Kataoka Nizaemon, Nakamura Jakuemon, Nakamura Ganjirô, Nakamura Baigyoku, Nakamura Hashinosuke, Kataoka Takatarô, Nakamura Kinnosuke, Kataoka Hidetarô, Ôtani Tomoemon, Ichikawa Danzô and Nakamura Karoku perform at the Shôchikuza! Nakamura Kaishun and Bandô Yajûrô perform at the National Theatre! Nakamura Tokizô and Onoe Shôroku are on tour in the Central Provinces! Ichikawa Somegorô, Ichikawa Komazô and Nakamura Kazutarô are on tour in the Eastern Provinces! Young actors perform perform at the Matsumoto Performing Arts Centre! 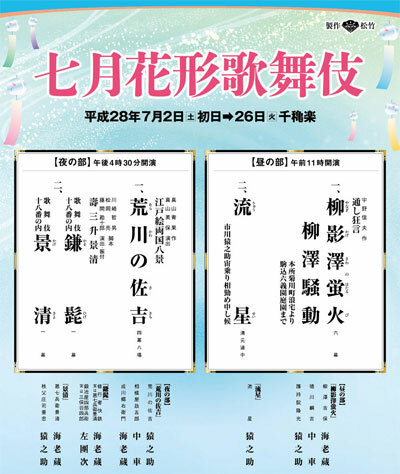 The zagashira for these two July Young Actors Kabuki programs is Ichikawa Ebizô and the main performing troupe will be the Omodakaya under the command of Ichikawa Ennosuke. Ichikawa Sadanji and Nakamura Tôzô are also guest stars. A lighter version of "Kotohoide Mimasu Kagekiyo", which was premiered in January 2014 at the Shinbashi Enbujô [more details], is made up of two spectacular dramas, "Kamahige" and "Kagekiyo", which belongs to the Kabuki Jûhachiban collection. A modern play by a 20th-century playwright Uno Nobuo. Yanagisawa Yoshiyasu (Ichikawa Ebizô) hopes nothing more than rising in the world as his mother hoped. Osame (Onoe Ukon) wants on the contrary nothing but love with him, but he recommends her as a concubine to Tokugawa Tsunayoshi (Ichikawa Chûsha), the 5th shogun of the Tokugawa shogunate. Thus he gets ahead in the world by making up to Tsunayoshi and his mother Keishoin. He has no hesitation in killing anybody who stands in his way, but what he ultimately obtained is only love of his lover Osame. Featuring also Ichikawa Ennosuke, Nakamura Tôzô, Kataoka Ichizô, Ichikawa Emisaburô and Ichikawa Emiya. In myth, the heavenly shepherd boy and celestial weaver maid only can meet once a year. They no longer are united than a falling star, or ryûsei appears with an urgent report, which actually turns out to be the story of marital discord in the family of the thunder god living in a poor tenement in heaven. The highlight of this dance is this story with the dancer changing instantly from role to role playing the thunder god, his angry wife, his little son and the elderly thunder goddess from next door who tries to break up the fight. Starring Ichikawa Ennosuke as a falling star, Bandô Minosuke as the heavenly shepherd boy and Onoe Ukon as the celestial weaver maid. Arakawa no Sakichi: a modern classic by Mayama Seika, this play set in the late Edo period combines tears and laughter as it focuses on a gang member caught between the bitter territorial battles of the people around him, and his fierce determination to raise his child. Starring Ichikawa Ennosuke, Ichikawa Ebizô and Ichikawa Chûsha in the roles of Sakichi, Narikawa Gôemon and Sagamiya Masagorô. Kotohoide Mimasu Kagekiyo: this drama presents the world of Akushichibyôe Kagekiyo with new perspectives. He was a warrior in 12th century and famous for the episode in "The Tale of Heike" which depicts Heike clan at the height of its prosperity, its defeat to the Genji clan and its downfall. Aku in his name means bravery which he demonstrates in wars against the Genji clan. Many legendary stories have been passed down about him as a rebellious hero: He is said to have planned to overthrow the Genji clan even after the downfall of the Heike clan and have tried to assassinate the Genji general Minamoto no Yoritomo 37 times. His mysterious stormy life is taken up as an attractive material in many genres such as Nô, Bunraku and Kabuki. 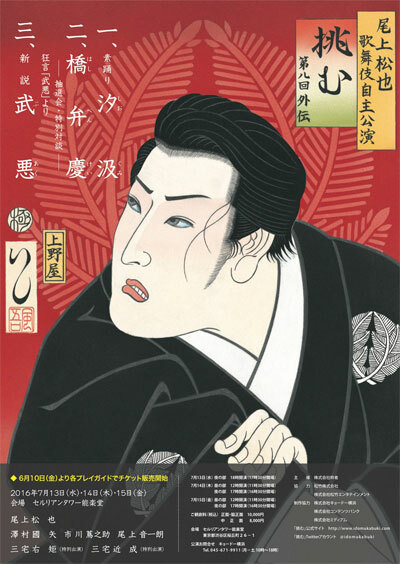 Kagekiyo appears in 4 of the collection of the Eighteen Favorite Plays of the Ichikawa Family (Kabuki Jûhachiban). Two of them are staged within "Kotohoide Mimasu Kagekiyo" : "Kamahige" and "Kagekiyo". Ichikawa Ebizô plays in the bombastic aragoto style the role of Akushichibyôe Kagekiyo. 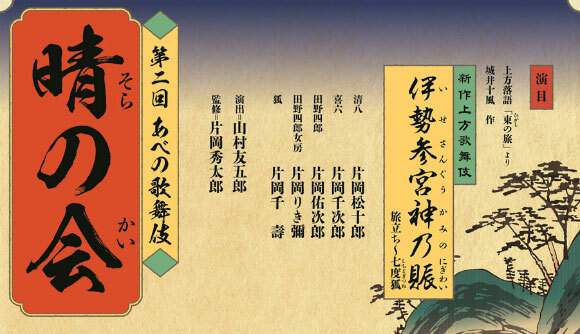 Featuring Ichikawa Emisaburô, Ichikawa Ennosuke and Ichikawa Sadanji in the roles of Akoya (Kagekiyo's lover), Chichibu no Shôji Shigetada (Kagekiyo's enemy) and Mionoya Shirô. 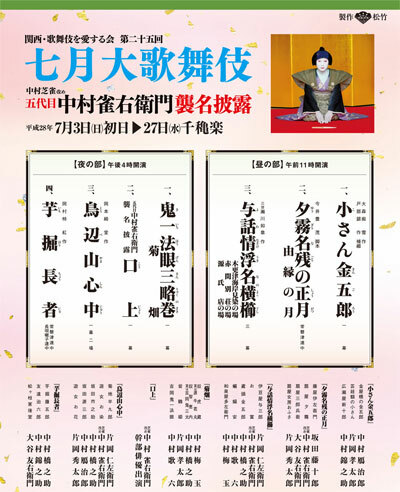 25th edition of the Kansai Kabuki Lovers Society July Grand Kabuki in Ôsaka. Nakamura Jakuemon V celebrates his shûmei in Ôsaka at the Shôchikuza. Kosan Kingorô: this is a rare revival of a play about the actor Kanaya Kingorô from the early Edo period who became famous for his love affair with the courtesan Kosan. Their story inspired all sorts of plays. In this particular one, Kingorô (Nakamura Ganjirô) is a barber and Kosan (Kataoka Takatarô) is a courtesan. They do not know each other, but get involved in helping a loving couple to be united by struggling to get a precious tea caddy which has been pawned for fifty gold coins. When they are successful, they gradually learn that they encountered each other five years before on a boat, fell in love, but parted without knowing the other's identity. Kingorô and Kosan are happily united. Featuring also Nakamura Kinnosuke, Kamimura Kichiya and Nakamura Kikaku. Yûgiri Nagori no Shôgatsu: the roots of this play go back to the earliest days of Kabuki. The young lover Izaemon (Living National Treasure Sakata Tôjûrô) has been disowned by his family for loving a courtesan. This role is a classic example of wagoto, the gentle style of acting that was popular in the Kansai region. His lover Yûgiri (Nakamura Jakuemon), the fabulous courtesan, died pining away with love for him. As he prays to Amida Buddha to hold a memorial service for her, he faints and she appears. They celebrate their reunion and reminisce about the past, but she disappears. He is pleased with seeing her though in dream. This particular version of the play was originally written by Chikamatsu Monzaemon. But since the original script had long been lost, this version of the story was written in 2005. Living National Treasure Sakata Tôjûrô will also wear a real paper kimono, the trademark of Sakata Tôjûrô I. Featuring also Kataoka Hidetarô and Ôtani Tomoemon. Kirare Yosa: Yosaburô (Living National Treasure Kataoka Nizaemon), the refined young son of a wealthy merchant falls in love with Otomi (Nakamura Jakuemon) the moment he first sees her on the beach. But Otomi is the mistress of a powerful gangster, and when their relationship is discovered, the two are attacked. Yosaburô is cut from head to toe and the two are dumped into the sea. Otomi lives and is taken in by a rich merchant (Nakamura Baigyoku) while Yosaburô is now covered with scars. Yosaburô turns into a petty thief and extortionist but one day, finds that the woman he is about to blackmail is none other than Otomi, alive and well. Featuring also Nakamura Hashinosuke, Ichikawa Danzô and Nakamura Karoku. Kikubatake: it is a great classic of period play Kabuki originally adapted from the Bunraku puppet theatre, full of larger-than-life characters and a stage full of dazzling color. In a garden of brilliant yellow and white chrysanthemums, there is Kiichi (Nakamura Karoku), an elderly strategist working for the dictator Kiyomori, his beautiful daughter Minazuru (Kataoka Takatarô) and two footmen, the elegant young Torazô (Nakamura Baigyoku) and the powerful Chienai (Nakamura Hashinosuke). But in fact, Torazô is a young general from the enemy side here to steal Kiichi’s secrets of strategy. Chienai is his retainer. But Kiichi has realized why they are there and also knows that Chienai is actually his younger brother. At the same time, Minazuru has fallen deeply in love with Torazô. Kôjô: the close relationship between the actors and the audience is shown by these stage announcements, lavish ceremonies to commemorate various important events. In this case, all the stars of the cast assemble to celebrate the shûmei of Nakamura Jakuemon V.
This play by 20th century playwright Okamoto Kidô mixes old and new Kabuki styles. The samurai Hankurô (Living National Treasure Kataoka Nizaemon) is in love with the courtesan Osome (Nakamura Jakuemon). Visiting her one night in the pleasure quarters of Kyôto, he gets into a drunken quarrel and ends up killing a man in a fight. Knowing that execution awaits him, the two lovers decide to die together instead. Hankurô and Osome travel the road to death in new kimono that ironically were made for them to celebrate the New Year together. Featuring also Nakamura Ganjirô, Nakamura Hashinosuke, Kataoka Hidetarô, Bandô Takesaburô and Ichikawa Danzô. The widow of the Matsugae family (Ôtani Tomoemon) who reigns over the district gives a dance party to choose a husband for her daughter Midori Gozen (Nakamura Kotarô). They plan to choose the man who dances the best. Tôgorô (Nakamura Hashinosuke) the potato digger comes with his friend Jirokurô (Nakamura Kinnosuke) pretending to be the best dancer in Japan. In contrast to Tôgorô, Jirokurô is a good dancer and he knows that Tôgorô is ardently in love with Midori Gozen. Jirokurô wears a mask and dances pretending to be Tôgorô. Then asked to dance without a mask, Tôgorô dances badly. The widow accepts Jirokurô's suggestion and orders Midori Gozen to dance with Tôgorô and Jirokurô. Unable to dance well, Tôgorô begins to express potato digging in dance. The people have never seen such an interesting dance and praise his dance to be the best in Japan. Tôgorô reveals his true identity and apologizes to them, but Midori Gozen would rather marry Tôgorô the potato digger than the best dancer. Finally they all dance expressing potato digging and congratulate Tôgorô and Midori Gozen. Educational program at the National Theatre called Kabuki Kanshô Kyôshitu ("Kabuki Appreciation Class"). This is a very interesting formula for the beginners because there is lively presentation of Kabuki (or some aspects of the art like music, stage tricks or fighting scenes) on stage, followed by the drama "Yanagi". Kabuki no Mikata: literally how to view Kabuki. A lively presentation of some aspects of the art of Kabuki. Yanagi: some hunters are about to cut down a willow tree to recover a trapped falcon when a man named Heitarô (Bandô Yajûrô) deftly frees the falcon, rescuing both the bird and the tree. Some years later, the retired emperor is suffering great headaches and a fortune teller has revealed that the same willow tree should be cut down and used to build a temple. As Heitarô and his family hear the sounds of the tree being cut down, Heitarô's wife (Nakamura Kaishun) suddenly collapses in agony. In fact, she is the spirit of the willow tree that has taken human form and become Heitarô’s wife in gratitude as he has saved her. The usual July Grand Kabuki Tour in the central provinces! Narukami: one of the most popular and universally appealing plays in the Kabuki Jûhachiban collection of plays featuring the bombastic aragoto style of acting. The holy man Narukami (Onoe Shôroku) is angry at the Imperial Court and has taken refuge in the mountains where he has imprisoned inside a waterfall the dragon that brings rain, bringing a severe drought to the country. Princess Taema (Nakamura Baishi) is sent by the Imperial Court to try to seduce Narukami, destroying his magical powers and release the rain. When he finds that he has been betrayed, anger transforms Narukami into a Thunder God. Fumi Uri: in the early Edo period (the early 17th century), peddlers would go around during the first few weeks of the new year with letters tied to a branch of plum blossoms. These letters were a kind of charm to bring wealth and romantic good fortune. In this particular dance, the highlight is a performance by the peddler (Nakamura Tokizô) who recounts a humorous story of a fight between high ranking courtesans that threw the brothel district into an uproar (from the pamphlet of "The Nishikawa School of Japanese Classical Dance Nihon Buyô in its San Francisco Premiere Performance"). Sanja Matsuri: a vigorous dance starring Bandô Kametoshi and Nakamura Mantarô. It is based on dolls at the Sanja festival showing the founding of the temple at Asakusa when two fishermen found a golden image of the Kannon in their nets. In this case, the holy spirits that they encounter are two spheres with the characters for "good" and "evil" on them, and the spirits possess the two and animate them into a lively dance. The usual July Grand Kabuki Tour in the eastern provinces! Goaisatsu: the close relationship between the actors and the audience is shown by this goaisatsu (literally greetings) kôjô performed by Ichikawa Somegorô. Sarashi Sanbasô: the white banner of the Genji clan has been lost in the Hakone Gongen shrine. This loss causes a uproar. Soga no Ni-no-Miya (Nakamura Kazutarô) is suspected by all around. Ni-no-Miya is in reality Princess Kisaragi, the daughter of Taira no Tadanori. She starts to perform a sanbasô as a dedication dance to the Gods of Hakone Gongen. Shortly afterwards, she uses the nuno-zarashi technique with the white banner of the Genji clan to tell her story. Matsuura no Taiko: Lord Matsuura (Ichikawa Somegorô) lives next door to the enemy of the loyal retainers and is disgusted because they do not seem to be interested in avenging the death of the lord. He is especially upset because he studied with the same fighting teacher as Kuranosuke, the senior retainer who should be leading the vendetta. Moreover, he learns from the haiku teacher Takarai Kikaku (Arashi Kitsusaburô) that his student Ôtaka Gengo (Nakamura Kashô) who should be part of the vendetta left a poem suggesting that he was forgetting his former lord and going to take service with another samurai lord. Gengo's sister Onui (Ichikawa Komazô) serves Lord Matsuura and in disgust he is about to dismiss her, when there is a disturbance from next door. The attack has begun, and in joy, Lord Matsuura counts out the strokes of the drum, struck in a pattern that is only known by students of his fighting teacher. There are many dances that show peddlers and other sights that you might have seen on the streets of old Edo. This short, energetic dance accompanied by the Tokiwazu style of music features a pair making and selling millet dumplings on the streets of Edo. Starring Ichikawa Somegorô and Nakamura Kazutarô. Yotsuya Kaidan: this play is a famous ghost story and at the same time a story written as the microcosms of human society under the historical background that the warrior class is falling down. Tamiya Iemon (Nakamura Shidô), a masterless samurai and ex-retainer of the En'ya family, asks his father-in-law Yotsuya Samon to allow his wife Oiwa (Nakamura Senjaku) to come back to him whom Samon took back to his house. But as he sees his wish not accepted and himself blamed for embezzling public money in the past, he kills Samon with his sword. Naosuke (Nakamura Kankurô) who fell in love with Oiwa's sister Osode (Nakamura Shichinosuke) bears a grudge against Osode's husband Yomoshichi (Nakamura Senjaku) and murders him cruelly. Oiwa and Osode hurry to the place where Samon and Yomoshichi were murdered. Iemon promises Oiwa to avenge her father while Naosuke promises Osode to avenge her husband. A few months later as Oiwa is doing poorly after childbirth, Iemon is tired of his poverty and becomes bitter to her. At the moment a medicine and a present for their child's birth is sent from Iemon's neighbor Itô Kihê (Sasano Takashi). As Iemon visits Itô to express his gratitude, Ito Kihê's granddaughter Oume (Nakamura Tsurumatsu) pines for Iemon and Kihê appeals to him to marry Oume. As Kihê is a retainer of Kô family, the enemy of the En'ya family, Iemon once declines the offer, but finally agrees to marry her. Taking the medicine from Itô not knowing it is a poison Oiwa's face becomes disfigured. Finally Oiwa knows the truth and dies having a grudge. Osode who has lived with Naosuke as a provisional couple finally gives herself to him. Her husband Yomoshichi who should have died earlier appears there. Oiwa's spirit torments Iemon while Naosuke and Osode fall by the irony of fate. What will become of them in the end? The 2nd gala of the Sora no Kai, in Ôsaka at the Kintetsu Art Kan, which stars Kataoka Matsujûrô, Kataoka Senjirô and Kataoka Senju, 3 disciples of the Matsushimaya guild. Sora no Kai literally means "Sky Association". "Ise Sangû Kami no Nigiwai", based on a famous Kamigata rakugo story, is a newly-created drama. It is staged under the supervision of Kataoka Hidetarô and the dance master Yamamura Tomogorô III. These performances are entitled Abeno Kabuki (Abeno is the name of a famous district in Ôsaka). The 8th gala program called Idomu (Challenge) for the young actor Onoe Matsuya. The first item is performed by Onoe Matsuya. The third item is a newly-revised version of the Kyôgen drama "Bukaku" and it stars Onoe Matsuya and the two kyôgenshi Miyake Sukenori and Miyake Chikanari.